Asia Pacific Garden Supplies - One of the Leading Exporters of Malaysia, Malaysian, Vietnam, Vietnamese, Outdoor Furniture and Chinese Pottery. APG Innovation Sdn. Bhd. 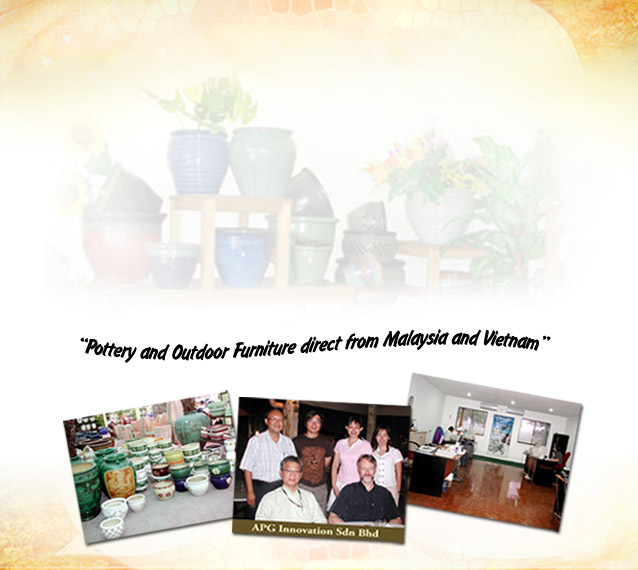 is currently one of the foremost exporters of Malaysian and Vietnamese pottery and garden furniture in the world. Our client-base includes customers from all over the world; particularly from USA, Europe, South America, Africa and Australia. In the 8 years that we have been in existence, we have actively participated in some of the largest garden shows in the industry; the National Hardware Show (USA), GAFA (Germany), and GLEE (UK), to mention but a few. As a main and leading producer of APG Innovation is , from time to time, made our best effort in adopting the latest technology combined with our ancestral Skill's to ensure the quality as well as the widest range of products for all user. Our owners and founding members each have on average more than 20 years experience in the pottery and garden furniture industry. Such experience has stood our company in good stead over the years and has resulted in the painstaking search and location of quality and aesthetically-pleasing products. Our commitment to excellence and superior quality even extend to the packaging and transport process; and we do not consider our job completed unless you, the customer, are satisfied with the final product.